This post is for my mom. She had surgery on three discs in her neck this week. So as a tribute to her, I smoked some pork neck bones. You know, to send some BBQ karma her way. My mom's neck bones may be recovering but there's nothing wrong with her funny bone. Her reply was, "How many times have I told you to change your pants before you go out to play?" This is also my third and final post about McCormick's 2012 Flavor Forecast, their annual focus on food trends and flavor profiles. This time I set my sights on the trend: Simplicity Shines. The most memorable food is often the simplest. As cooks focus on highlighting quality ingredients with simple preparations, they have moved away from the clutter of complex presentations and flashy innovations. Their creativity is mindfully balanced with a dose of restraint. Clear, unpretentious flavors are an approachable celebration of the basics - and remind us what real food tastes like. I took this one about as simple as one can get. Just a handful of simple ingredients and a good dose of hickory smoke. 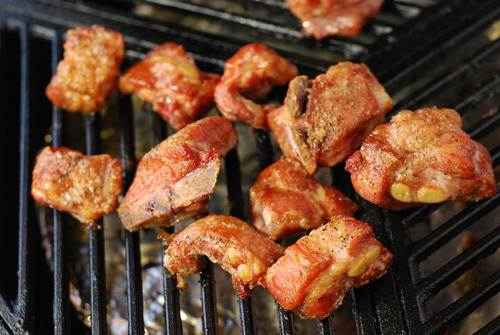 This process lets the pork take on the smoky flavor in a short smoke on the grill but saves some of the fat and connective tissues to break down during the simmer, adding flavor to the beans. Season pork with 2 tsp salt and 1 tsp black pepper. Place on the grill to smoke for 1 hour. For any thin strip pieces, fold them over to make them as thick as the other pieces. Meanwhile, use the "quick soak" method with the beans according to package instructions. Drain the beans. Remove the pork from the smoker. 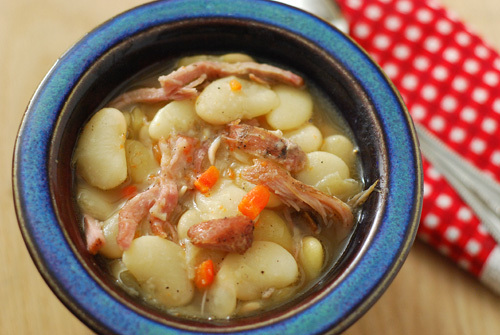 Place the pork, drained beans, bay leaf, 2 tsp salt and 1/2 tsp pepper in a 3 quart pot. Add 6 cups of water, bring to a simmer and cook (gentle simmer but be careful NOT to boil) with the pot lid on, but slightly open for an hour. Remove the pork shred the meat using two forks, discarding any bones or cartilage. Return the shredded meat and add the carrots to the pot. Cook another 30 to 60 minutes, until the sauce is thickened. Easy: Use a standard charcoal grill with Kingsford Hickory briquettes banked to one side. Easier: Skip the smoking and buy a smoked ham hock. Gas: Use Patio Daddio BBQ's tips for smoking on a gas grill. Egg: I used my Big Green Egg loaded with coal and two fist sized chunks of hickory buried near the top of the coal. Platesetter in legs up, drip pan, neck bones on top of the cooking grid. 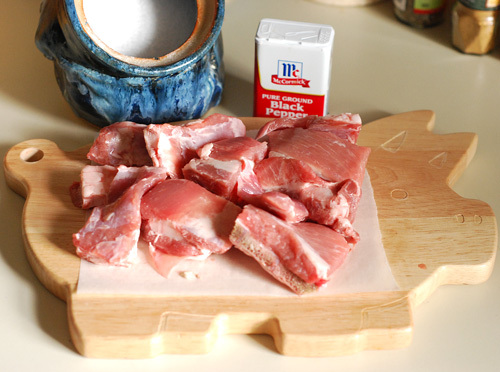 Pork neck bones shown are NOT in the anatomically correct position on the cutting board. They are "cooked" at this point, but not "finished". The magic happens as the connective tissue breaks down and mixes with the beans. 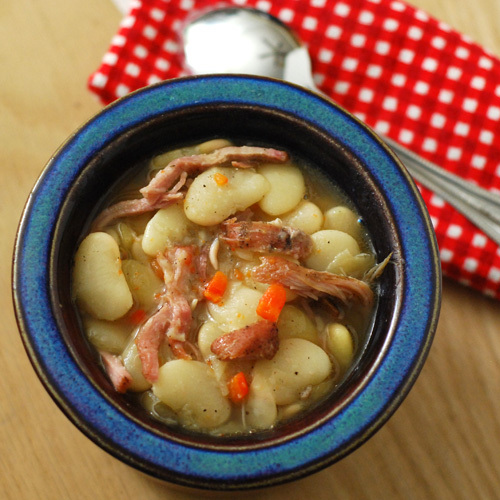 Serious good comfort food that isn't a pain in the neck to make. [Standard Disclaimer] I received compensation from McCormick's representatives for promoting their 2012 Flavor Forecast but the opinions stated are my own. 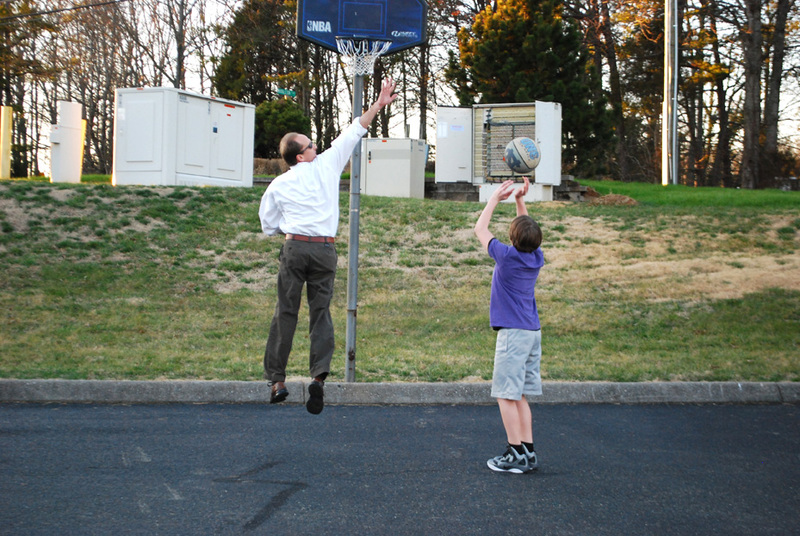 I did NOT receive any compensation from the NBA for the mad basketball skills I display in the action shot. Shame, isn't it? I could have my own line of Nike dress shoes.